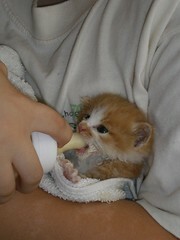 Kitten feeding can feel like a difficult process without a mother cat to do it for you. Newborn kittens are so tiny and fragile, and have to operate almost entirely by instinct. It may seem a daunting task at first, but the process of kitten feeding with a bottle is not so much from that of feeding a newborn human. Once they know what to do, they will do it all on their own. All you have to do is show them proper care and follow a few simple guidelines.